Perry was born into existence on September 16, 1893, during the historic Cherokee Strip Land Run. It is a community bonded with friendly people and caring citizens. Conveniently located on I-35, Perry has small-town charm and fascinating local history. The historic Noble County Courthouse, built in 1915, is the centerpiece of the beautiful Courthouse Square surrounded by a unique downtown area that offers restaurants, clothing stores, specialty gift shops and antique and craft stores. 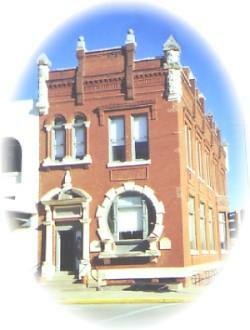 Perry Main Street is home to one of the oldest cafes in Oklahoma, the Kumback Cafe. Perry residents have celebrated the founding of the community every year since 1893. The Cherokee Strip Celebration is held in September, and the annual Spring Heritage Festival in May provides shows, entertainment, living history events, and the museum's Rural Heritage Festival to a day full of activities. The town had a very colorful beginning and is named for J.A. Perry, a member of the Cherokee Strip Commission during President Grover Cleveland's administration. The Rose Hill School is a furnished one-room country school built in 1895. In schools like this one, students received their eduction from the first through the eighth grade. Rose Hill School was moved to the museum grounds in 1971. The St. Rose Catholic Church built in 1922 welcomes visitors through its magnificient set of brass double doors artisticly decorated in metalwork of symbolic emblems representing twelve saints.